The sooner we are able to detect a cavity, the sooner we are able to plan treatment to prevent further tooth decay. Our laser cavity detector emits pulses of light through your teeth to look for small cavities that may not be found by simply inspecting your teeth. The procedure is simple and painless. 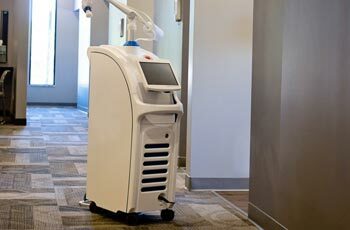 Our Grandville dentists use the latest dental technology to make sure you receive the best care. Since most of our patients drink fluoridated water and use toothpaste containing fluoride, we have seen less and less cavities form on the enamel surface of teeth. This is because fluoride strengthens tooth enamel against decay. Unfortunately, this also means that when cavities do form, they often start in the soft dentin layer beneath tooth enamel. Without a tooth cavity detector, these cavities can grow from the inside out until you have to schedule an emergency appointment for a persistent toothache. Thankfully, our family dentists are able to use laser cavity detecting technology to help you maintain good oral health. When tooth decay has been detected, the light bouncing back will cause the tooth to fluoresce. The more the tooth fluoresces, the bigger the cavity. The detector will also beep to indicate if a tooth is starting to decay. Sarah Palmer DDS and Amy Harmon DDS are dedicated to helping patients maintain beautiful healthy smiles through preventive dental services. If you have a toothache and suspect a cavity, give our dentists in Grandville a call at (616) 534-0080.